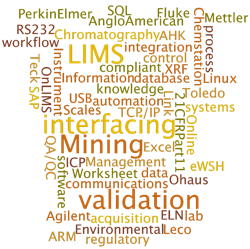 OnLQC is the Online LIMS Quality Control and Assurance Control Module. Unlike other QC systems, OnLQC is an advanced interactive statistical module. The two graphic cursors allow the user to include or exclude outliers for statistical analysis. Data points may also be hidden, removing them from the statistics calculations to observe the effect of outliers. Each point can also be individually annotated, further documenting QC issues. The LIMS QA/QC module plots Shewhart control charts with standard values by report or worksheet and provides the analyst with the data required to make informed decisions. Other charting options include: Cumulative Sum and X Control. All of these charts can be exported directly to MS Excel along with all the pertinent statistics. OnLQC provides “real time” QA/QC data by automatically extracting the standard samples from the reports and updating the QA/QC database. A distribution curve chart graphically displays standard data and lists the range, average, standard deviation, and the number of data points collected for the standard. OnLQC also includes a SRM (Standard Reference Material) database that once configured, allows the technician to locate the appropriate SRM for the current samples quickly and easily. The raw data from OnLQC is exportable into Excel for further analysis. The various chart types are selected from a dropdown and instantly recalculated and plotted. All charts are exportable as metafiles which can be resized without line distortion. This is an excellent feature that allows you to create professional looking reports in Microsoft Word, PowerPoint or any other publishing tool.